And those who took the time to experience the nearly two dozen Free Speech Week events, which end today, April 11, certainly encountered a range of different topics. The relationship of micro-agressions to the First Amendment. The campus time, place and manner policy (basically free speech policy). How the Dreamer and undocumented populations can exercise their free speech rights. The role of police at demonstrations. 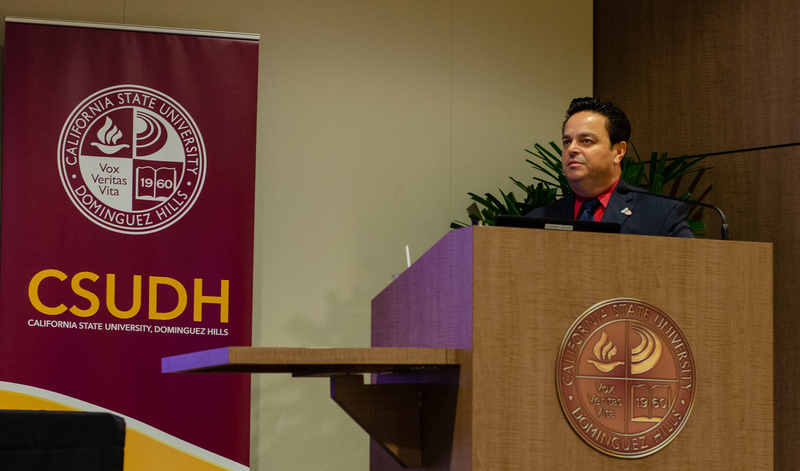 Not to mention academic and religious freedom, a keynote address by Carson Mayor Albert Robles, and several others, all of which incorporated some mix of students, faculty, administrators, invited speakers and, yes, even the CSUDH Bulletin, as we hosted a trivia contest about the First Amendment. Spawned by agreement between Dr. Parham and the CSUDH Academic Senate about the importance of a weeklong series of events focusing on free speech, particularly in our current polarized climate, the week concludes today with six events, including ones on academic freedom, civil discourse, hate speech,a spoken word open mic, and concluding address at 7 p.m. in the Extended Education Auditorium. Brooke Nelson, a lecturer in the (soon-to-be-dissolved) humanities program, is the coordinator of Free Speech Week. She said while different aspects of free speech were covered, each event addressed two fundamental questions: What is free speech, and how to exercise it? The main takeaway she gained from the first three days, Nelson said, is how appreciative students were that the events provided “such a welcoming space,” for people to share their opinions and hear from the various speakers. “There has been a real communal sense,” she said. Kevin Acosta, a senior computer tech major, was one of the panelists (he, along with Wendy Ortiz, both members of the Computing Alliance of Hispanic-Serving Institutions, also ran a session about how to effectively practice free speech on Wikipedia). He said initially he thought his opinion that most people would find no value in being offended would be in the minority, based on his perception that most college students react to the offensive nature of words, rather than use them as an opportunity to engage in dialogue. To his surprise, Acosta said, his opinion wound up being in the majority. That notion of being exposed to other’s viewpoints and listening, rather than merely reacting, and then learning, was a byproduct of what Nelson said was “the really good back and forth,” and “lively conversations,” that typified most of the events, particualry the Q&A sessions. For information on today’s Free Speech Week events, visit https://torolink.csudh.edu/organization/freespeech.